This job is special to us. 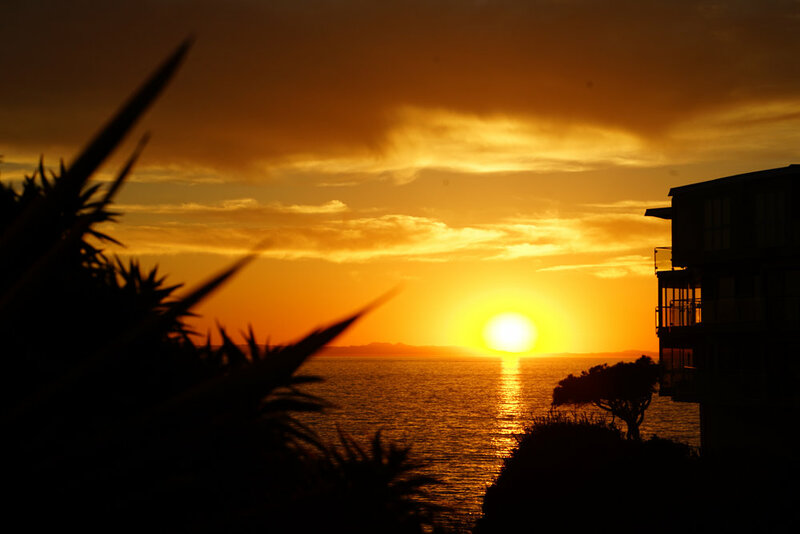 This was our first California job where we were given a chance to stretch our legs–and stretch we did! 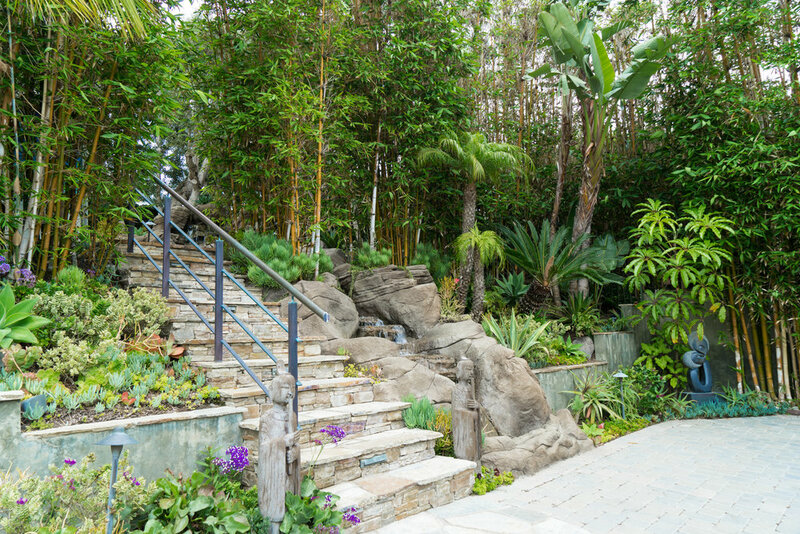 We poured our hearts and souls into this project and found several creative ways to breathe life into this homeowner's personal paradise. 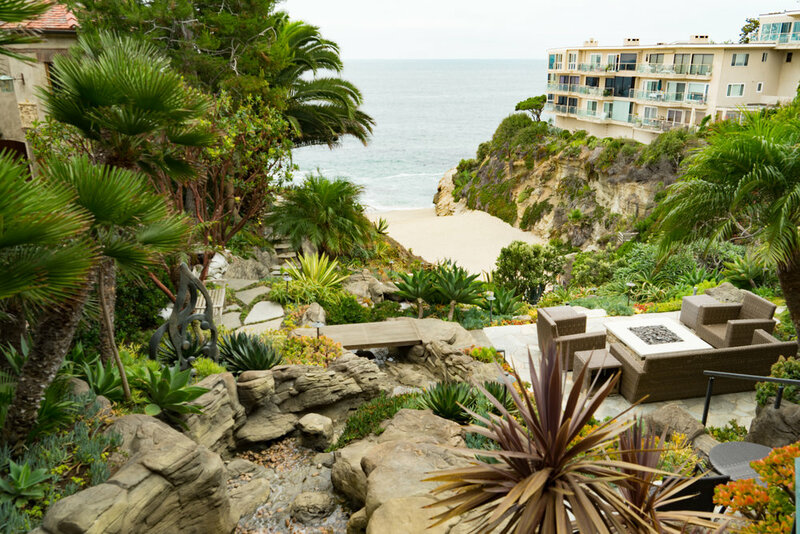 One year and thousands of man-hours later we planted our last tree and the happy homeowner affectionately named his property "The Hanging Gardens of Laguna." We think that's perfect. Below are the details of the job, but of course if you have any additional questions, feel free to drop us a line! We'd be happy to fill you in on any of the details. We noticed the rocks on the beach below the house had distinct, slanted sedimentary lines and we decided to copy the look with the rock lines of the falls. 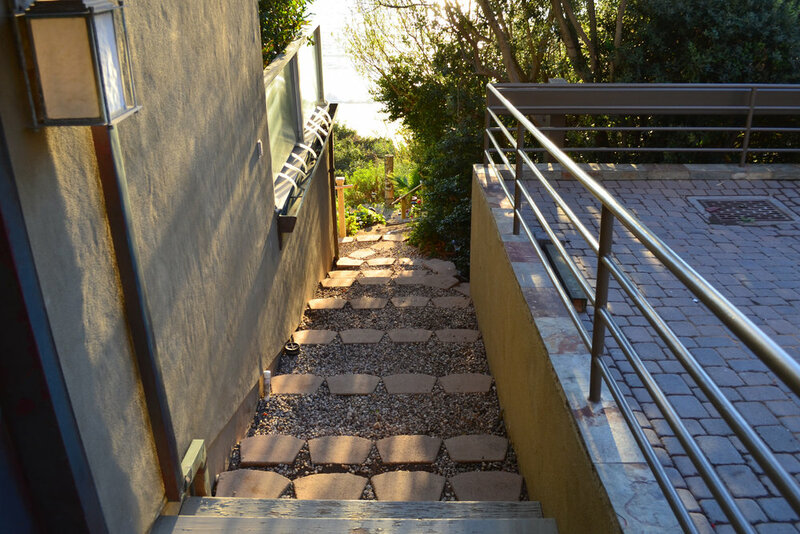 The idea is to give you a taste of the natural view in the back yard from the first moment you see the property. This property is surrounded by incredible natural beauty and our impulse was to borrow from that beauty and blend into those surroundings. 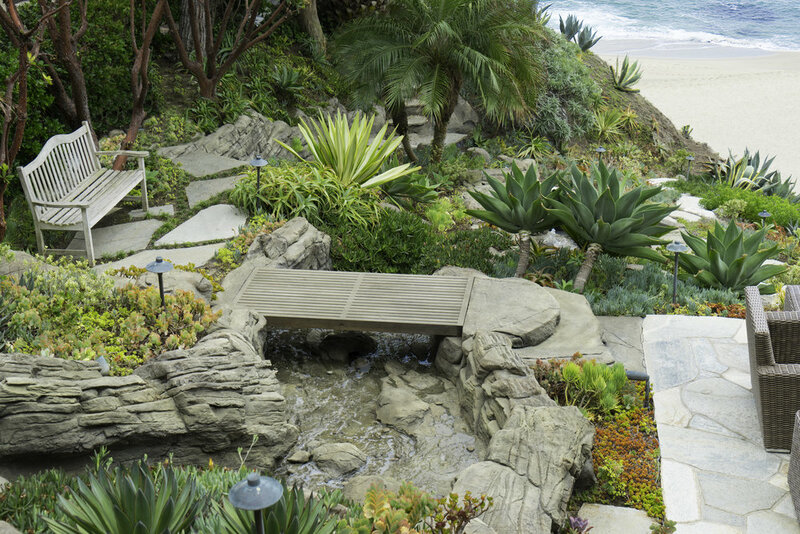 The story of this design starts in the front yard with a bold, 40 ft long waterfall that gives the illusion of continuing into another, larger water course in the back. 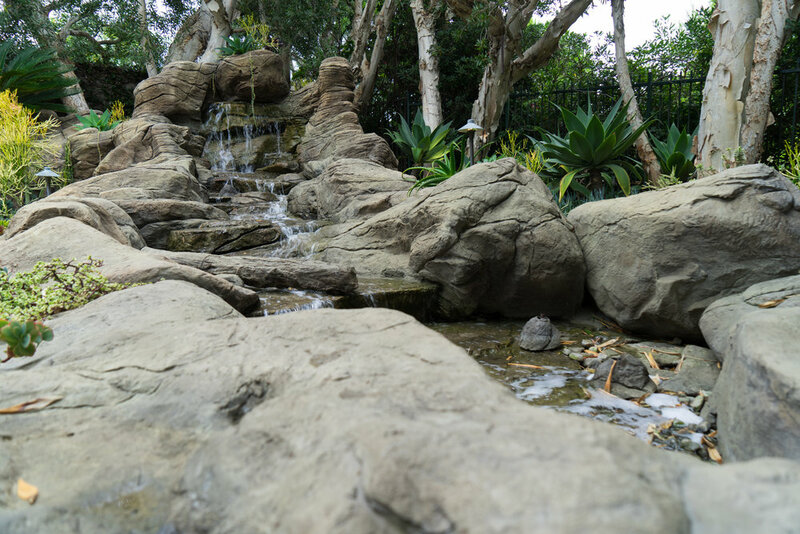 In total it's 105 feet of falls that give a sense of continuity between the front and back yards and the surrounding area. Construction on this section of coastline provided a few challenges. Accessibility was the biggest issue. Click on the image below to see the challenge of planting trees in this space. The most impressive part of this natural landscape is the view. We wanted to make sure there was no shortage of places to sit and enjoy it. Some were obvious, others were meant to be a bit more subtle. Every Job is personal to us and we like to show it. 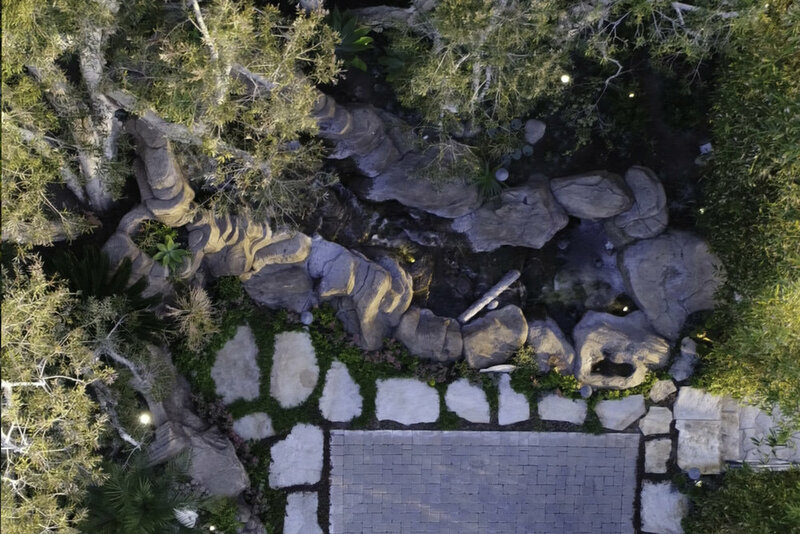 On this project we wanted the homeowners to forever be part of the landscape and pressed their hands (and one very small foot) into the last stone. In order to maximise the existing guest parking spaces we surrounded the drive with flagstone to provide a little extra room to walk and enjoy the space. It's always fun for us to see the dramatic difference between the start and finish of each project. Below are some of those images.